According to the fount of all human knowledge, the Wikipedia, the world’s first android phone was the HTC Dream, released on October 22, 2008. 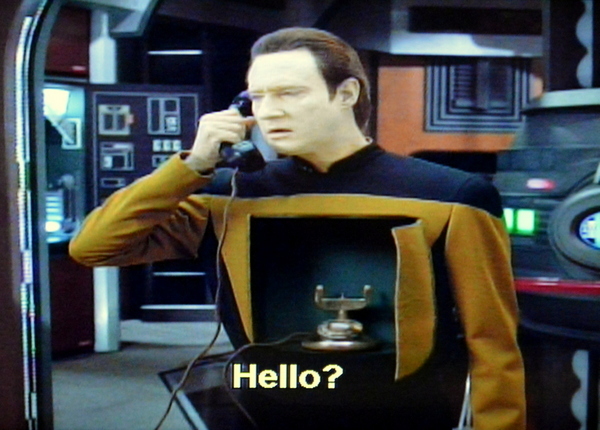 Screencap from Star Trek: The Next Generation, season 7, episode 6: “Phantasms”. The screencap above is from Star Trek: The Next Generation, season 7, episode 6: “Phantasms” where the android Data has to adjust to suddenly being capable of experiencing nightmares. P.P.S. Incidentally, The HTC Dream would make a great name for a spaceship, don’t you think? If I ever got to name one, it would be an iteration of the northern lights – aurora borealis, nordlys (Danish), goleuadau gogleddol (Welsh – wow, looks so fun), or something in that vein. You?